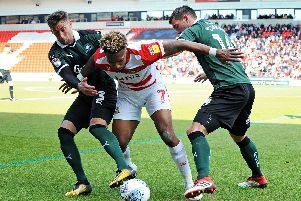 DONCASTER Rovers will start the season without half-a-dozen players who would normally be challenging for a place in the starting line-up in tomorrow’s testing Championship opener at Brighton. Influential skipper Brian Stock, who had a second ankle reconstruction operation in the summer, faces being out until at least late September or early October and he’ll be badly missed as Rovers look to repeat last season’s flying start. The last couple of years haven’t been kind to Stock, who may well have been playing top flight football now had it not been for back and ankle injuries. Rovers are by no means a one-man team. But there is no doubting the fact that they have played some of their best football over recent years when Stock has been on song. Stock’s partnership with Richie Wellens, now plying his trade at Leicester, was as good as anything in the league in Rovers’ first season in the Championship. Stock recalled that he had to have three injections in his back prior to helping Rovers beat Leeds in the League One Promotion Play-Off final at Wembley. He admitted that it was not the only time that he’s had to have injections in order to play in recent seasons due to various injuries. “I’m so desperate for the club to do well and I always think that I can make a difference when I play,” he said. “I played games last season when I know myself that I shouldn’t have played but there have been times when I’ve done that and I’ve played well and there have been times when I didn’t. “It’s a hard thing to judge and a tough decision to make at times. “I’m pleased how my rehab is going but it has been frustrating watching the lads training and playing pre-season games because as a footballer you want to be out there with them. I just love playing football and that will never change for me. “Obviously the money is important because you have to look after your family and football is only a short career. “But you start playing football for the love of it and if you play well the financial rewards will follow and that’s what I tell the young lads that I speak to. “We say it every year, but it’s such a tough league,” he said. “Having said that there is always the belief that an unfancied team can actually do something. You look at the likes of Norwich, who did extraordinary well last season, and you had Blackpool the season before. Two of the teams who could prove a surprise packet are promoted Brighton and Southampton. The first two games that Southampton-born Stock looked out for when the fixtures came out were the games against the Saints. “As soon as the fixtures came out I had about ten messages in as many minutes from family and friends down there,” he said. “Fortunately I should be back by the time we play them,” he said.